The house is a bright, newly constructed ( in 2005) 3 bedroom home near the Siesta Beaches. This property is nestled in a quiet community a 10 minute walk from the white sands of Siesta Key's Crescent Beach and 3 blocks from the shops, restaurants and boat rentals of Stickney Point Bridge area. There are plenty of good restaurants, coffee shops, pizza, ice cream and boat and bike rentals within walking distance. This home is built on the property that has been in the family since the '50s, and is situated at the front of a large 0.4 acre property with half of it a fenced-in, grass backyard. Kids and dogs love the safe environment in which to play as adults watch from the large (12' x 40') enclosed lanai, or the kitchen or great room. Two bedrooms (12' by 10' with a queen bed and 12' x 10' with two twin beds) and a full bath are on one side of the house. A large (14' X 28') and open great room is in the middle with a view of the backyard and the lanai through 3 sets of glass French doors. The master bedroom (12' x 13') suite with queen bed, and kitchen are on the other side of the home. The home has a lovely terrazzo-type floor, new furniture, a fully-functional kitchen, fast internet and WiFi throughout the house and part of the back yard..
We built this place specifically as a bright and airy beach house in 2005. It is designed to accommodate our family and pets in carefree, tasteful and low maintenance living. This house is designed to stand up to hurricane winds, with low energy usage due to its special construction. We have tried to make this a turn-key place for visitors to enjoy, from coffee grinders to hairdryers, we have outfitted it for our use and yours. There is also a guest book, that we and visitors update with menus and brochures from local sites and vendors, including such things as rentals for cribs, baby strollers and sports equipment. There are several places to setup an 'office' for those who can't get completely away from work. We hope you enjoy it! This property is located across the Intercoastal Waterway from Siesta Key on Beechwood Ave., which means you can visit the beaches without having to put up with traffic on the only two bridges, it is a quieter location, and the price is right. Another advantage of single family homes is that you are not limited to a single car. There is a local property manager nearby that will take care of your needs and of course, you can always contact us with problems, questions, suggestions or feedback. BTW, the reviews and photos you see are real. All of our winter renters are returnees, some for 7 years or more. Four of the past renters have purchased their own homes in the same neighborhood. I am a Sarasota (Siesta Key) native. My grandfather created Palm Island on Siesta Key, and in about 1947, I helped my father build the original Beach Club (in the village on Siesta Key). Although we live in the San Francisco area now, my family and I return as often as we are able, often for a month or more, with or without the two mini Doxies. To us this is the most relaxing place on earth. Because we fly from CA, the place has to be complete. We often host the whole family (7-10) for Thanksgiving dinner. We designed the house and had it built in 2005, but this property has been in the family since 1959 when my parents retired. The location is ideal because it is just OFF the Key to avoid heavy summer/winter traffic, but within easy walking distance of Siesta Key beaches, boat and bike rentals, and several very good restaurants, especially for breakfast. If you don't know about Siesta Key you should Google it, because it is stupendous and way too much to describe here. However, I'll add that building sand 'drip castles' on this beach is something every one from 2 to 92 should do at least once in this life. We rebuilt the house in 2004/5 to be our ideal Florida beach house. We live in California, and we made sure the house is fully outfitted so there is no need for us to bring anything with us on the plane. For us this is a place to go to 'decompress' and relax. We think the beaches are the best in the world, and that big back yard is so quiet and relaxing. There is always some part of the yard in shade and some in sun, so we each have our favorite spots. When we finally get a good dose of relaxing on the beach, on the lanai, in the yard, or on a boat, there are so many things to do nearby the biggest problem is which? The wireless high speed Internet even works in the back yard if you are an email junkie like me, or should actually have to do some work. If they wish, we stay in touch with our guests, by email/phone, during their stay to answer questions, recommend restaurants and things to do. The local manager has also lived there for a very long time, so there is no shortage of 'tourist' info. There is a 3-ring notebook that is actively maintained both by us and renters with places to go, menus from favorite restaurants, and house info. We also own/rent the house next door (VRBO 483975) and there is a secret removable section of fence between them. Also ceiling fans and a whole-house fresh air fan. Central heat and air, not window units. Regularly serviced under contract. Entire unit replaced in 2017. Part of the air conditioning equipment. Also some beach towels, but those get used up regularly, so no guarantee unless you make arrangements ahead. Good coverage of the house, lanai, and yard. Part of large LR/Dining/Kit. See photos. Slip covers on upholstered furniture. Programmable, at least 12 cup. Uses the basket style (round) filters. Also a Keurig 2.0 single-cup maker. Grinder for those who prefer to buy beans. Fitted with all the things we need when we are using the house. Microwave, coffee maker, coffee grinder, toaster, waffle maker, blender/food processor, Keurig coffee maker, LOTS of pots/pans, etc. Table expands, plenty of chairs. Frontier fiber cable TV and Internet. Good selection of TV channels. A couple of shelves of books, plus the usual big booksellers within 4 miles. Kids toys and games come and go, as left by past renters. Also baby/children's equipment rental place nearby. Simple, single speed adult bikes. Let me know if you will be depending on them so I can be sure they are in fully operating condition when you arrive. For any who recognize Robert Trent Jones... there is a course here called Bobby Jones, which he designed before he was famous. MANY courses in Sarasota. Vaulted ceilings throughout. The most common comment we get: "This isn't just a rental, it's a home"
We rented this home for the month of March, 2019. It is by far the best home we have ever rented in the Sarasota/Siesta Key area. It is located in a quiet neighborhood close to the beaches of Siesta Key . The home itself is beautiful and very well kept. 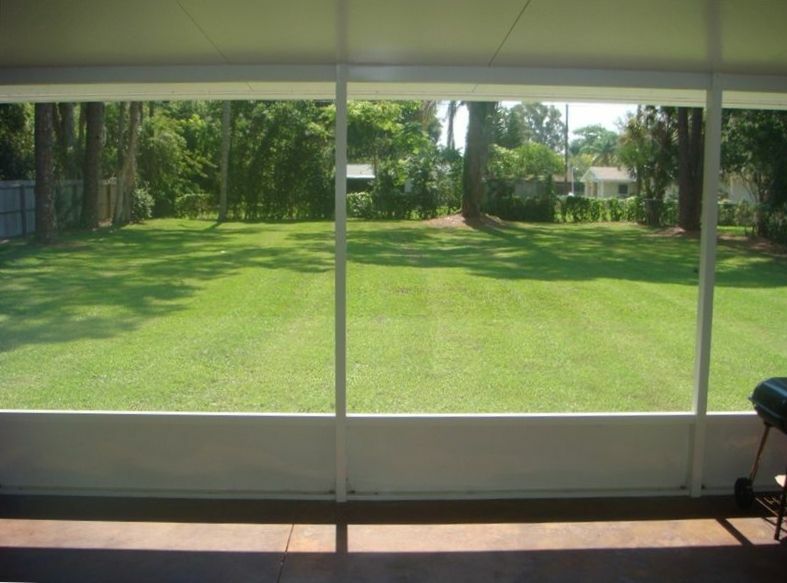 We thoroughly enjoyed the spacious screened porchwhich provided views of the huge backyard. The kitchen was well stocked with anything you would need to prepare a meal. The beds were comfortable and there were ample towels and extra bedding available. This house is a gem and the pictures and the description are totally accurate. We had a wonderful time and hope to return. I cannot help but repeat how special this piece of heaven is. We are usually in Sarasota in March. However, I would HIGHLY recommend you consider this for your family's summer vacation. It is ideally located for the surplus of activities to enrich the lives of your children; play at the beautiful white sand beach and relax in the comfort of this house. The yard with shade and sun is more than ample for your pets and little ones. All the reviews are true so I will not expound. You will regret not considering this comfortable, welcoming home. We love this house, neighborhood, the bubbly and efficient property manager and responsive owner. We stayed for 2 weeks in April and the whole month of December in 2014. The house is very comfortable, completely equipped and much better looking in real life than in the photos. The yard is perfect for our dogs and the neighborhood a friendly place to trot them around. The neighborhood doubles as a bird sanctuary; beautiful beautiful birds sing and play. In December a Bald Eagle stopped by. This is a really great home, welcoming in every way, a definite must stay. This was the second summer we rented this beautiful home. The location and the house are perfect!! You don't need to bring anything but clothes-this house has everything you could ever need. We love the huge fenced-in backyard to play ball with our dogs and we especially enjoy riding our bikes to the Siesta Key beaches, the Siesta Key village and even to Publix. The neighborhood is quiet and very family friendly and close to the beach, downtown Sarasota, Venice and many restaurants. Highly recommended for a cozy, relaxing vacation. Did you like what you saw in the listing photos? It looks exactly like it in person!!! This is a lovely home which feels just like your own home! You will be able to prepare any meal you desire because the kitchen is so well appointed. You can also scratch the cooking at home idea and eat at one of the wonderful restaurants in the area. The owners have complied an excellent notebook of interesting dining options, as well as information on what to do in the area. It is a 5 minute walk to Cresent Beach, or you can jump in your car for a 5 minute drive to Siesta Key Village beaches. I travel with my two dogs, and they can't woof enough about the GREAT YARD...totally fenced in with plenty of space to run and play with the neighbors' pooches. The neighborhood id very quiet and safe. I was completely satisfied with the home! It was everything and more than I expected!!! Kudos to theproperty owner and the management company for being so accommodating and answering any questions I had. The month went by too quickly!!! I didn't want to leave! Best vacation rental I have found in the Sarasota area!!! Two thumbs and eight paws UP!!!!! This lovely home is complete in every aspect and is as advertised by the owner. Our grandkids and pet were never bored with the large, fenced yard to run and play. Guests needs to bring only their desire to relax and enjoy themselves on Siesta Key or downtown Sarasota. We have visited this area over 30 years and this is, by far, the best accommodation in the best area. Can't wait to return in 2011. And they are still with us for the 2013 season. We always solicit suggestions, and theirs have been very helpful, not only at this property, but also at the new one we just built next door. Siesta Key Beaches...Easy walk, about 6 blocks. if you have never been there you MUST go see them., The whitest finest sand in the world and warm calm water., If you have been there 'nuf said. $500 deposit due with reservation, 50% due 30 days before arrival (not with reservation), balance on arrival. Jan. renters can usually arrive on 12/31 to avoid travel on New Years Eve.